This game has hidden development-related text. This game has unused abilities. Mario & Luigi: Superstar Saga was the third Mario RPG game, the first on a handheld system and the first of the Mario & Luigi sub-series. The game was released 14 years later on the 3DS as Mario & Luigi: Superstar Saga + Bowser's Minions. For versions of games released in such a short span of time, there sure are a lot of these. A kiosk demo with significantly rearranged stats, maps and events? That's not something you see everyday. The game has eight unused audio tracks. Some appear to be finished while others appear to be early versions of existing audio tracks. 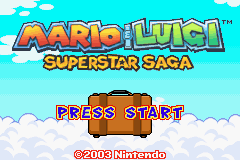 Additionally, there exist two variants of the title theme from the Japan-only game Tomato Adventure, which formed the basis for Superstar Saga. This jaunty little tune starts off similar to Little Fungitown's music. A variant of the battle theme. Possibly an early revision. This song is the first of two variants of the Tomato Adventure title theme. It uses the Game Boy's pulse channels for lead and harmony, rather than using samples. The second variant of the title theme from Tomato Adventure. This song uses samples for the lead rather than the Game Boy's pulse channels, unlike the first variant. Also, it does not loop. A quite sinister theme that sounds similar to Woohoo Hooniversity. A variant of the Teehee Valley theme without the lead. A variant of the Beanbean Castle Town theme without the lead. An alternate variation of the File Select theme. 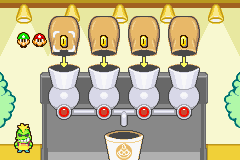 There's a large amount of leftover text and sprites which suggest that originally each drink you made at the Starbeans Cafe was supposed to trigger a cameo by a different Nintendo character, instead of just E. Gadd (who incidentally also has his own unused text). Cashier :  Oh! Professor Gadd! E. Gadd :  Oh! Just wonderful! A new blend! How about a try, youngsters? my spirits during ghost research. you. I insist you take this. Wario :  Ah ha ha ha! Move it! your tab from the other day! Wario :  What are you talkin' about?!? Cashier :  Aww, come on! Just pay up! I'll even take beans if you got 'em. Come on! You're a rich guy, right? celebrity guest stars in this game? Wa ha ha ha ha ha ha! wanna go shave my tongue! to taste our new juice? No way! A call :  Fox! Help me! Er, I mean, one busy fox! Fox :  Thanks for the discount! Will this cover the rest? Olimar's dialogue would have been presented in item text boxes as opposed to speech bubbles (as if he is logging his thoughts rather than actually speaking, befitting of his native series). Cashier :  Wow! This is a rare treat! If it isn't Captain Olimar! stands a strange life form. holds is the source of the aroma. I shall now partake of its flavor. Why! Its flavor is most satisfying! attack it before it attacks me. Cashier :  Whoa! A power outage? rocking and rolling as usual! Hey, buddy! What are you doin'?! Are your engines on full throttle? get lost in a dungeon again? Are your hearts filled now, kiddo? All of Link's sprites have the kanji 仮 in the top corner, which translates to "temporary." You got an Energy Tank! You got a Gold Ring! You got the Game Boy Horror! You got a UV Lamp! You got an Excite Spring! There are Bean Fruits matching the colors of the seven hungry Yoshis. In the final game there are only plain Bean Fruits, which use the sprite of the Purple Bean Fruit. You got a Blue Bean Fruit! You got a Red Bean Fruit! You got a Green Bean Fruit! You got a Yellow Bean Fruit! You got a Purple Bean Fruit! You got an Orange Bean Fruit! You got an Azure Bean Fruit! Blue Bean Fruit A juicy blue bean grown in the ground. Red Bean Fruit A juicy red bean grown in the ground. Green Bean Fruit A juicy green bean grown in the ground. Yellow Bean Fruit A juicy yellow bean grown in the ground. Purple Bean Fruit A juicy purple bean grown in the ground. Orange Bean Fruit A juicy orange bean grown in the ground. Azure Bean Fruit A juicy azure bean grown in the ground. There are also item descriptions for Neon Beans. These match the colors of the Neon Eggs found in the final game. Neon Blue Bean A bean that shines with a bright blue light. Neon Red Bean A bean that shines with a bright red light. Neon Green Bean A bean that shines with a bright green light. Neon Yellow Bean A bean that shines with a bright yellow light. Neon Purple Bean A bean that shines with a bright purple light. Neon Orange Bean A bean that shines with a bright orange light. Neon Azure Bean A bean that shines with a bright azure light. The following equipment exists in the game, but you're unable to obtain any of them during the course of the game. They're listed together with their in-game description. Chuckola Pants - Pants made to look like Chuckola Fruit. Heavy Slacks - Very heavy pants made of Hoohoo Blocks. Light Slacks - Very light and made of Parabeanie wings. Jeanie Jeans - Magic jeans that boost DEF in battle. Jeaniest Jeans - The best-looking, best-fitting jeans. Safe Guard - An outfit that blocks status ailments. Oho Gear - Pants with a raging wave print. Interestingly, the Oho Gear is obtainable in the Japanese localization of the game, but is unobtainable through legitimate means in the original English release. You got a Game & Watch! The Game & Watch was probably supposed to be a key item, since it appears in the game's text right after the Beanlet and Beanstone text. You got a Spiritual Bros.! This could have been a badge. Either way, it isn't coded in the game. The flaming Woohoo Hooniversity statue has animations for burning and being extinguished. Unused item sprites of a book, diploma, and key. Unused coin sprites, including a palette for red and blue ones. They also have animations for blinking as though they are about to disappear. Unknown round objects in pink, blue, and yellow. Possibly early badge models. They highly resemble the badges seen in-game, although the badges in-game are all pink. An unused sprite of what appears to be an early Lady Lima. An unused cloaked Beanish character. Boddle's assistant has an alternate palette. These colors do end up being used in the remake, Mario & Luigi: Superstar Saga + Bowser's Minions. Shocked animations for the surfing minigame's green Oho Jee. Possibly a Fighter Fly drawn in the style of older Mario games. The final game uses a different Fighter Fly design. Parts of a side view of Wiggler on the overworld. An unused sprite of the statue from Woohoo Hooniversity on fire. Early ability icons. The final "bubble" sprites are larger, and the final icons are bigger and more detailed. Colorful letters that spell out "MARIO✩." These polka-dot triangles are contained with the MARIO✩ sprite. The eighth triangle has transparent dots. A dummy Goomba enemy. At level 100, it has 100 HP, 3 DEF, and 100 Speed. A dummy enemy, also at level 100. It has 0 HP, 3 DEF, and 100 Speed. Players get 999 EXP points after defeating it. Another dummy enemy, with the same stats as the dummy Goomba. A blue palette swap of the Goomba enemy. It has stats lower than the average Goomba. Same as above, except it's a red palette swap. A paragoomba! It has lower than average stats. Sprites exist for a taller Bill Blaster with a longer attack animation. There is also a golden Bullet Bill, which is known as Bombshell Bill in some Paper Mario games. A different Sgt. Starshade than the one seen in the battle tutorial. At level 100, he has 100 HP, 3 DEF, and 0 Speed. He would give out 2 EXP and 2 coins upon defeat, except the game freezes when he is attacked. Appears to be a standard Hoohooligan. Not seen in battle through normal gameplay. These enemy names are listed in the ROM, but they don't appear in-game. 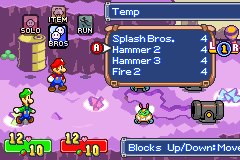 Sledge and Mallet appear in the hammer battle tutorial, but since Mallet can't be targeted, his name never appears. More than likely an alternate name for the Mecha-Chomp enemy. This was supposed to be one of the names of the ???? enemy which appears in Gwarhar Lagoon, as is evident by the official Nintendo Power guide which actually lists this as the enemy's name. Likely alternate names for the Left Claw and Right Claw from the Hermie III battle. The name of the countdown Bob-omb that appears in some of the Koopaling battles. Since a Time Bob-omb can't be targeted, the name never appears. Two enemy scripts can be found at 0828335C and 082833C8 in (U) version. These two scripts are mostly alike, but the second one has the arrow keys. When it is an enemy's turn, it'll wait for you to press a button before attacking. A button - Attack Mario with first ability. B button - Attack Luigi with first ability. L button - Attack Luigi with second ability. R button - Attack Mario with second ability. Left arrow key - Attack Luigi with third ability. Right arrow key - Attack Mario with third ability. There is a somewhat buggy debug room hidden in the game, which can be accessed by using the code 02001E90:0001. To bring Luigi along with you, put in 02001E9C:0001. After the game resets, turn on the code. You start in the left map with Mario alone. It's possible to leave through the northern part of the stage and immediately return with Luigi. Returning with Luigi alters the level somewhat, or perhaps takes you to a different room. It's possible to return to the first map (with Luigi still) by walking north on the "island" at the top-left of the stage. The multiple copies of Popple don't say anything despite having a "talk" icon appear when you're next to them. 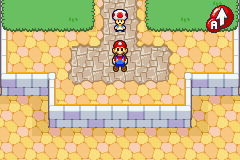 Touching the Beanie in the second map immediately begins a battle with a single Goomba. The game crashes after pressing A when a message bubble appears reading "Press the A button here!" In the first map, it's possible to get stuck in the air (still able to walk around) by jumping into objects from below. In the first map, it's not possible to walk up hills. They act more like walls. With Mario alone, pressing Start exits the room and attempts to take you back to where you saved your game, but essentially freezes the game. If you use 02006E15:DB for Mario and 020071B1:DB for Luigi, you should be able to walk up the slopes in the buggy room. This just removes the 20 flag that causes the glitches. Alternately, if you are using the (U) version, put in 082FB0B3:6F for Mario and 082FB0C7:6F for Luigi. 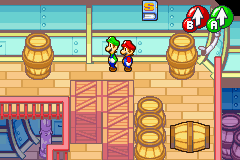 This is Mario and Luigi's data in the NPC section. 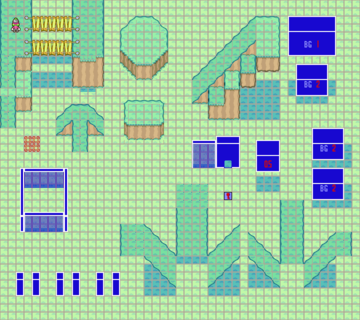 Add the rest of the unused rooms. 0004 (Seabed), 0005, 0008, 0009 (Bicycle Blocks), 000D (Cutscene Debug Room), 0016 (unused Starfields room), 01FF. This screen looks very much like the Starbeans Cafe in-game, however, you are given four numbers without bean sprites above them. Future games have a similar debug menu. Many of these warps will affect you items, coins, and flags that are set/unset. You can go up to 80, 40, 20, and 15 for each option respectively, but the ones at the end are usually glitched/don't work. 0 = Teehee Valley - Cutscene where Peach is captured at beginning. 7 = Beanbean Castle where the camera guy is at. You are also given 684 coins. 10 = Teehee Valley - down a yellow pipe. 11 = You are in Beanbean Castletown outside Starbeans Cafe, with 99 of each type of bean. List the rest for the first three options, and maybe include images of each case? There's a Toad programmed out in Toadtown Square that can be programmed back in by memory editing. You can walk right under him, and he has no conversation or movement data. In the room on the Koopa Cruiser where battles with Goombas are available, there's a disabled Save Block able to be programmed back in. It is fully functional, and saves the game like it is supposed to, though the game displays glitched text for the area in which it displays where you saved at. There are placeholder Bros Attack entries which can be turned on by setting the appropriate flags. They all have the in-battle description Temp. When used, they deplete the brother's BP and the turn ends immediately; Nothing happens. A more complete list can be found here. There seems to be a bank of pointers to gsys labels located at 0839ECC4 in the (U) version. (083A0504 in (E), and 08388B34 in (J)). Above and below this bank seems to be associated with this. Probably used as On/Off for Mario and Luigi. Was this once used as a debug menu? It is assumed that the assembly codes that used this data were deleted before release. Some of these gsys labels have "kusu" in them, which comes from the Japanese name for Oho Oasis, Kusu Island; the hand powers are named "solar" and "moon", apparently in reference to the Fire and Thunder Gods who teach the moves (their heads are shaped like the sun/moon respectively). One of these has "Kuppa" in them, which is the Japanese name for Bowser/Koopa. These labels seem to be related to the flags located at 02004338. It's unfortunate that labels weren't found for the rest of them. In battle, you only see 240×160 of each background, but the backgrounds themselves are all actually 512×256. Only very few battles make use of scrolling in any way, such as the final battle and Trunkle. Perhaps scrolling was originally intended to happen in all battles, as is the case in Bowser's Inside Story. This looks like something that might have been used as a template for making the backgrounds. If the battle data's background is 00, it will use the Room's defined battle background, if that is 00, then you could get this background. Note: The animated dust clouds are not shown. Note: The animated flames are not shown. Note: Unused. 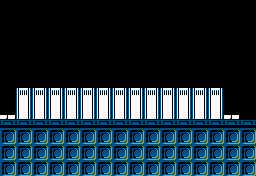 Enemies do not appear in any of the rooms that use this tileset. Note: Unused. Enemies do not appear in the room that uses this tileset. The stars twinkle more erratically than shown here. Note: The final battle does scroll some in the beginning. The animated lightning bolts are not shown. 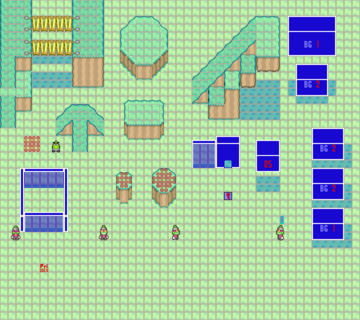 Graphics and a tilemap for a Wrecking Crew-like scene exist within the ROM. A proper method of accessing them has not yet been discovered. The following build dates are found in the ROM at 0x5202A4 in the US version, 0x521C74 in the European version, 0x4119A0 in the Japanese version and 0x33bb6c in the Not For Resale Demo. This page was last modified on 5 April 2019, at 17:05.